Did you check the ignition timing? I once got a BMW 2002 for $500 because it wouldn't run. Turned out that the ignition was 180 degrees out. I swapped the spark plug wires to the opposite sides of the distributor and it fired right up. The ignition is setup the same way it was when I had it running last summer, so I don't think that would be the case. Thanks! Hoping to do some more good changes to it, but still keeping in the bounds of what it is. Worked on it at Chuck's last Saturday. I placed the spark plugs in the in the 1 3 4 2 order, but I had done it clockwise, not counter clockwise. 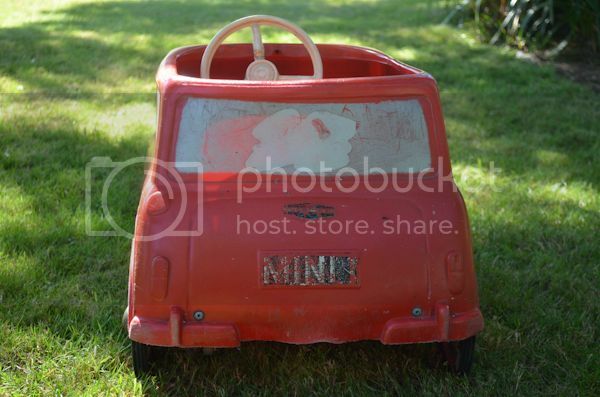 Thanks to Chuck for pointing that out, the Mini was running shortly after that. I still need to install the air cleaner and then we need to check to see if its idling / running right. We also installed the new front brake hard line and new braided brake hoses. We also removed the vented 7.5 discs and re-installed the solid 7.5 discs. They are bit old, but can be run next season and then I will replace them with new ones. 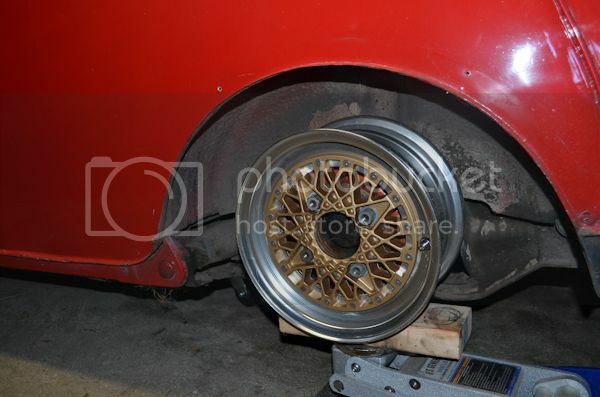 The KAD 7.5 calipers were also installed, but I didn't take any photos. 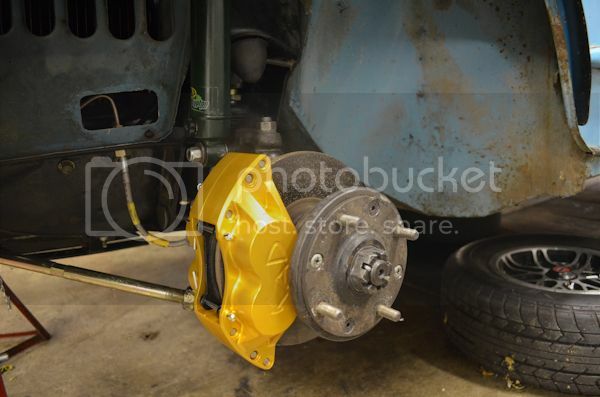 We still need to bleed the whole system, so I will get photos of the brake components then. Why did you choose to go back to a solid rotor? Surface area of the solid rotor is so small that it dissipates heat fairly quickly. 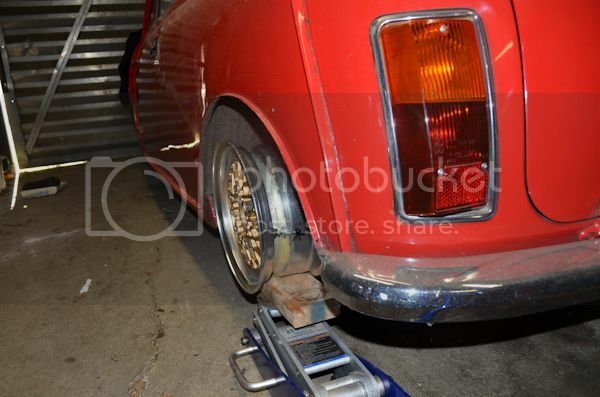 Also, I was having fitment issues with the old caliper / disc setup. They don't actually make a vented 7.5" disc. You have to turn down a 8.4" vented disc. We bled the whole system and ended up with a firm pedal, only a couple of leaks to tighten up and a replacement of a c-clip. The left side rear radius arm cover, subframe bolts (to put anti-seize on), and bracket came off with no issue. 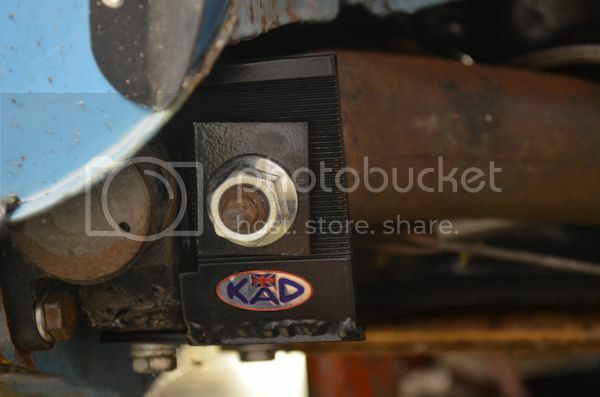 KAD camber / toe bracket was able to be installed with no issue. However, the right rear radius cover's screws had rusted themselves to the cover. After Chuck attempted to drill them out with no luck, he took a Dremel to it and cut the heads off. Hopefully Gunnar can extract the rest of the screw when I take the car to him later this summer. Not happy with how far the pedal travels until it firms up. I have already upgraded the rear wheel cylinders to be the correct ones for front disc brakes. Does an adjustable brake bias help with brake pedal travel at all? My son's Mini showed up today. 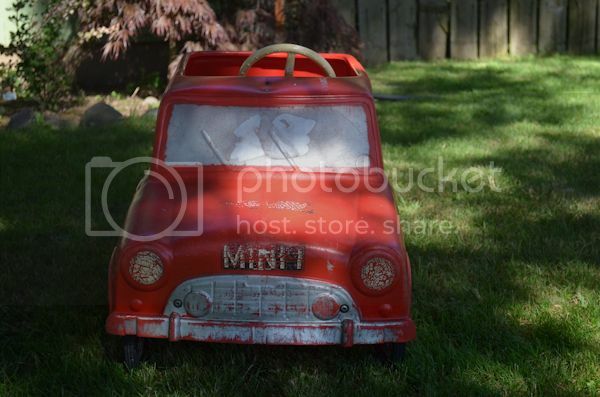 It is a Leeway Mini Cooper Pedal Car, or something along those lines. I have been looking for one for almost two years and had just mentioned to my wife that one would make an awesome Christmas gift. The car is in better shape than I thought, most of them have split or warped severely because of being plastic bodied. 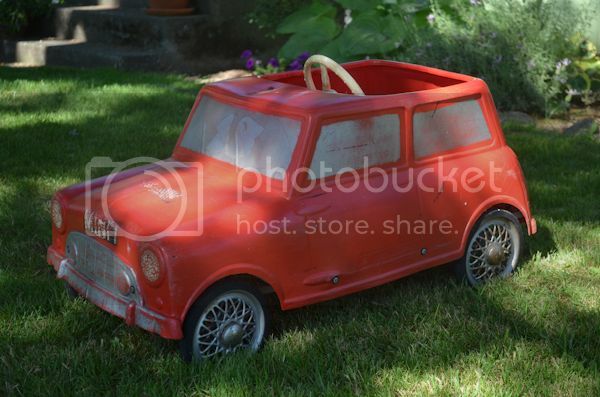 The plan is to get it restored and have it for my son to pedal around in at home and also at the British car shows we go to in my Mini. He is about 8 inches too short to reach the pedals right now, but hopefully we can give it to him on his 2nd Birthday, and he will be able to use it then. Thanks! They were only made in the 1960s, so they are pretty rare. 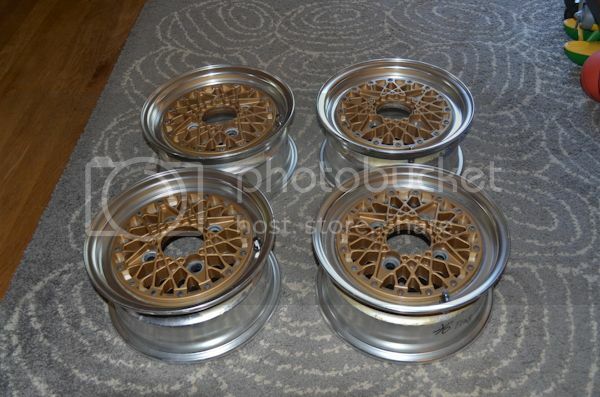 My SSR Formula Mesh wheels showed up from Japan. I am pretty sure the ad originally stated that they were 10x6, but when I go back and look at it, it no longer states that. I measured them and they came out to 10x5.5. My current wheels, which I will run part of the year are 10x5. Since both wheels are my favorite wheels for Mini's, I will run one set to some shows and then another set to other shows. Since this set is only .5" wider than the other one, it will actually work out better and not change the look of the car too much. 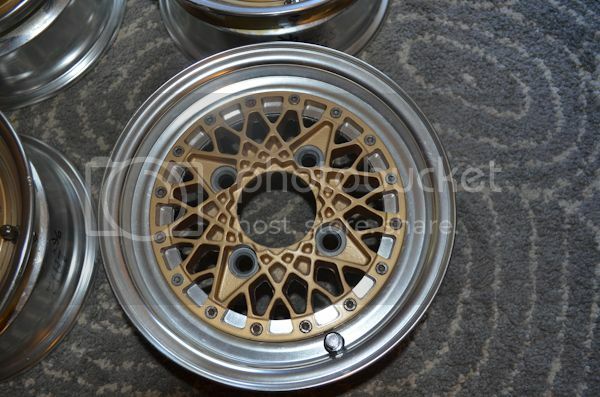 The SSR Formula Mesh wheels are a 3 pc wheel, and currently the faces are mounted to the outside of the lip. I am going to do a test fit and see how fitment is, but I might move the face inside the lip instead. The plan is to clean up the lips, re-do the centers, and find new wheel bolts / nuts as the current ones are pretty corroded. Overall, I am pretty happy with them, and they are rare wheels to begin with, kind of like my original Cosmic MK2s. I am also glad that they came with the original center caps, as I hate running wheels without center caps. are those center caps.. clear? Nice! I keep on thinking of doing new wheels on the Jetta, but the only three that interest me are next to impossible to find and would have to come from Europe. They are black. I just saw no point in taking them out of the packaging when I won't be using them anytime soon. Ya, I have been looking for these for awhile and just decided to pull the trigger. Used the Clubman for some test fitting. 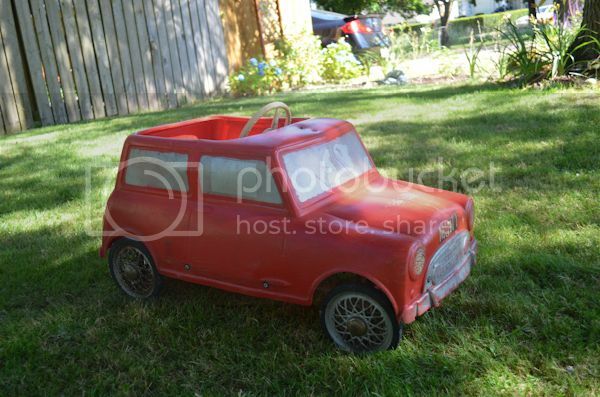 I am going to definitely have to figure out some lug nuts for it. I should be able to move the centers to the inside. I'll know more once I take it apart. 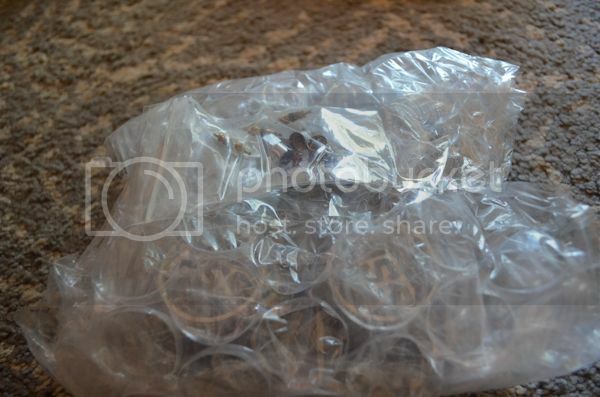 I also hope that I will have enough clearance on the front for these to fit over the KAD 4 pots. The right wheels really make a car. Work done on 7/3, completed by Chuck on 7/4. Chuck and I went to work on installing the KAD Rear Swaybar on Friday, after a very good Thai lunch. It mounts differently then most of the swaybars that Chuck has seen, in that it mounts at the back of the rear subframe. We both agree that KAD is very good at engineering (though a lot of holes had to be enlarged), but is rather bad about creating directions. They used upside down images and then right side up images and didn't really call out the differences, leave a lot of trial error and very little use of the directions. At the end of the day we had the bar, blades, brackets, and drop links installed. Chuck ended up having to drill out the blades as well, so that the drop link could attach to it. Another issue with the KAD rear swaybar is that it gets in the way of the standard side exit exhaust. Chuck said that he figured out a very genius solution to get it all fitted correctly, I have yet to see it though. Pictures to come once I see the car again. I picked up my interior on Sunday and will be assembling the seats in the next week or so, just to see how they feel, as the interior won't be going into the car until next late winter or spring. I'll get more pics of them as well, hoping that it is as comfortable as they looked in the original pictures. Spoke to Gunnar about putting a satin clear coat on the car and he is fine with it. I will be having him do a check over of the car at the same time and repairing stuff if need be. He will also be re-pinning the driver door hinges, as I wan't to keep the original ones and replacing all of the seals (Front and Rear Windscreen, Doors, and Quarter Windows). Continue to try to figure out what motor I want to build / buy; keep it simple or build a pocket rocket? 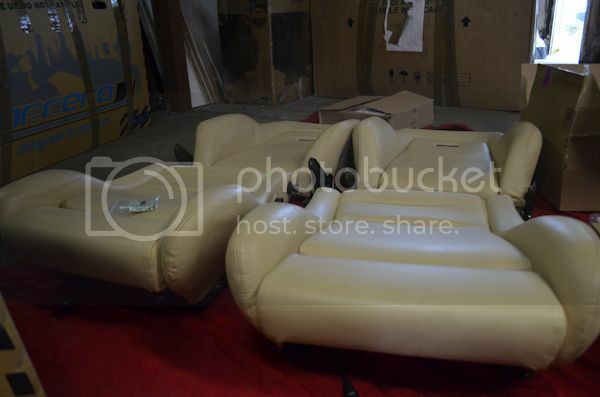 Apply some measure of sound deadening, at least in the floor and headliner areas, some of the front bulkhead as well. If anyone has any leads on a MK1 Austin early speedometer, I would appreciate that, as I would like to run a very simple dash and original. I am sure this list will be changing a bunch, but that is all I have for now. Was looking for an update with interior, saw Chris got the new LT.
Just about to give another one! 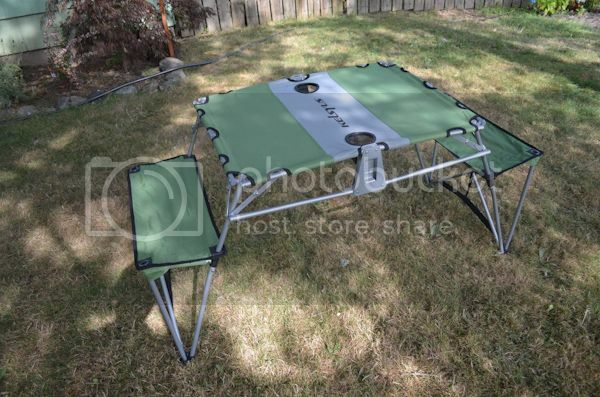 I've been looking at portable picnic tables and came across this one that seems to have pretty good reviews on longevity as well as being semi-compact. It's a two person table, but we tested it out and it should fit the three of us pretty nicely. 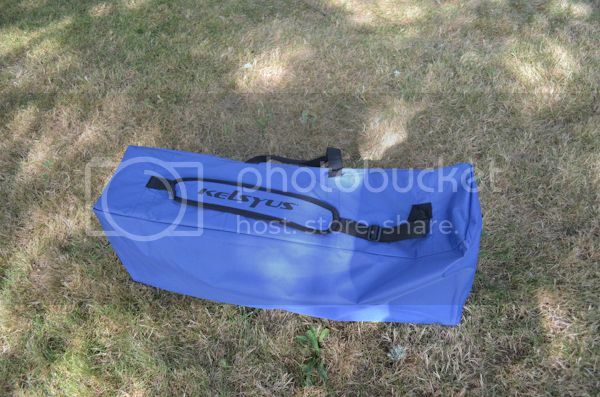 It's mainly for the shows that don't have too many tables, if any, plus also for camping. Unboxed most of the interior and was super impressed with it. The interior itself is a lot more high end then I thought and the fit and finish is fantastic. The front seats were redone in leather, but the rest of the interior is vinyl, which is fine. 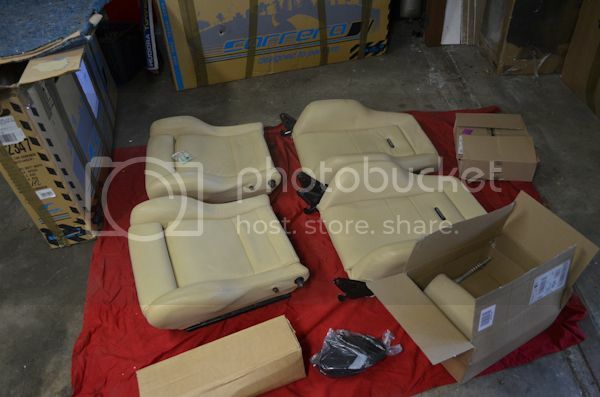 I wasn't expecting the seats to have so much bolster, as it looked a lot shallower in the pictures that the seller sent me. I love bolster on seats, and love how much bolster are on these seats. I plan on putting them together in the next week or so. This interior is almost too nice for the blue Mini, but it'll be nice and comfortable for us, as well as look good. 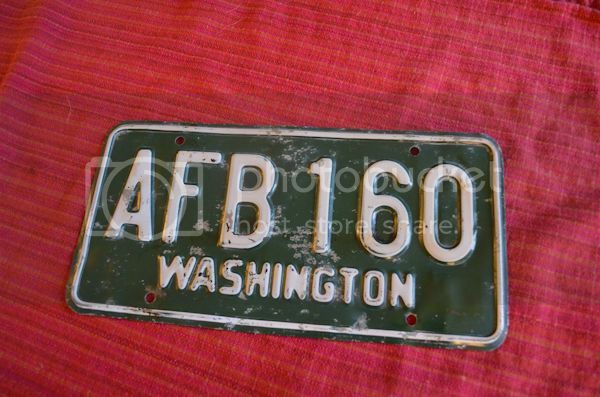 Received my vintage Washington License plate to replace my Collector Plate. 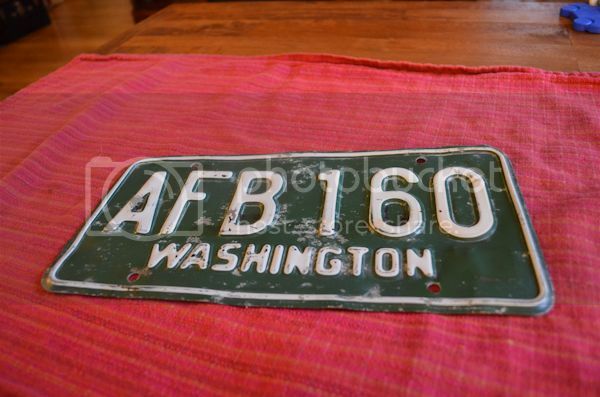 I think it'll suit the car. All times are GMT -8. The time now is 00:54 AM.